It comprises of racking structure and specially designed robots which synergies to achieve accurate and high throughput. Our AS/RS is indigenously developed and manufactured by our team. It is typically used in application where high volume of inventory is moved in and out of the system. These AS/RS is a computer controlled system, maintaining accurate inventory of stored goods. It also determines and allocates storage location for the all inward goods and retrieve specified goods with high degree of accuracy on request. AS/RS is most reliable system to process complex tasks with high efficiency. Bar code close loop feedback system gives physical location of retrieval machine in long travel and hoisting position. Motion of retrieval is programmed for higher speed, higher acceleration and deceleration to achieve more throughput of palette. WMS will help in optimum utilization of warehouse capacity, increased number of throughput and optimum number of retrievals. Optional dual wheel drive for optimal performance. 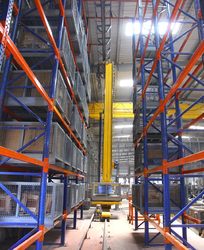 Narrow Aisles = More Storage Space – Narrow aisles provide an easy pathway for AS/RS system cranes to navigate as they retrieve product with speed and accuracy. Real-time inventory control - Because of the automated computer system, inventory levels are updated on the spot. Automatic inventory control lets you know exactly what you have on-hand at all times. Improved handling ability - AS/RS systems can handle, store and retrieve items of any size quickly and accurately. Their design allows for multiple loads to be retrieved at once. Picking accuracy - With an automated storage and retrieval system you will notice improved picking accuracy with pallets, cartons and cases. Order picking is guided by computerized lasers which target items. This is useful in narrow aisles where picking can prove problematic. Better inventory management of foodstuffs - Due to the accuracy and speed of the AS/RS system, you will be able to reduce spoilage of food products. Ideal for any environment - These systems can be adapted to special working conditions such as freezing temperatures (-30 °C), extreme humidity or special features including the possibility of increasing standard working speeds. Perfect for hazardous materials - AS/RS systems are safe and can handle the moving and storage of hazardous materials. Customizable - You can set your AS/RS system up to exactly fit the needs of your warehouse and company. Small building footprint - These systems are great for high-density storage and offer modular design that is easily expandable as your inventory, warehouse and business grows. Furthermore, AS/RS systems allow for vertical, horizontal and lateral movement making navigating down narrow aisles a breeze. Plus, AS/RS systems do not require unnecessary parts and attachments to function which minimize expenses.